Description: 100% PURE ACETONE perfect for removing just about anything.Remove nail poli.. Description: This Pump Dispenser is used to dispense liquid from the bottle in a handy, easy .. Description: It can also be used for creating dots - of an even or decreasing size - and to p.. Description: Crystal clear round glass empty bottle for polish, cuticle oils and more. .. Description: Fashion Style, Easy use and comfortable. Soft material feature, Profes.. Description: Nail Art Hand Cushion / Pillow for nail treatment This Nail Art hand C.. 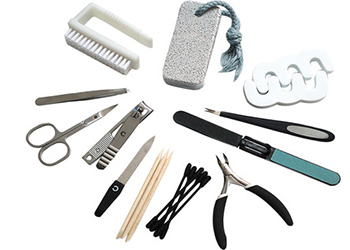 Description: Nail Scrubbing Cleaning Manicure Finger Clean Plastic Dusting Brushes. .. Description: Find your nail powder at a glance Keep different tips separate .. Description: Find your nail powder at a glance Keep different tips separate A.. Description: Marbleize of the file-holder and stainless steel design make it very delicate.&n.. Description: Pack of 100 4.5" in Length Natural Orange Wood Gentle and .. Description: Durable, Washable and Reusable Comfortable Foam Color..